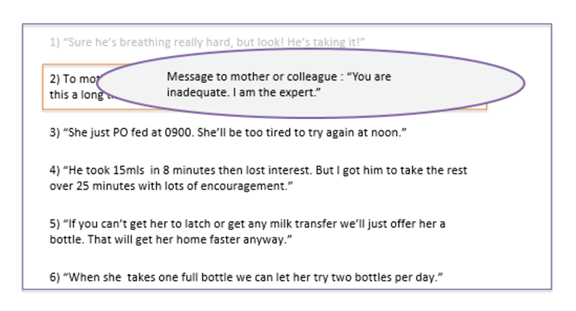 In the hectic throng of everyday NICU work, we sometimes forget how powerful our words and actions are, especially when interacting with families. Families often report that they ‘hang on every word’ spoken by the professionals that are caring for their baby. In that light, our words take on a certain depth we may not be aware of. That message is rooted in a volume-driven culture, where ‘getting the volume in’ is the #1 priority, whether spoken or unspoken. That culture developed over decades of time and cannot be unraveled in a few weeks. However, it can absolutely change over time with education, support, self-reflection, practice, and leadership. After teaching the art and science of advancing oral feeding practice to thousands of neonatal professionals for over 17 years, we are confident that no matter what tools, scales, or algorithms you integrate into practice, the changes will be short-lived and/or suboptimal if the underlying culture of feeding is not wholly addressed. 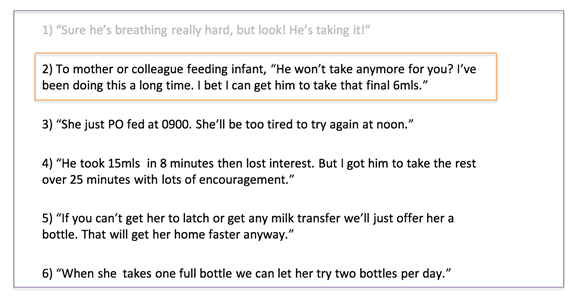 The language in scenario 2 reflects the infant-driven culture in which specially educated neonatal professionals educate parents in a way they can understand so that parents become the experts at feeding their baby regardless of route i.e. breast, bottle, tube. Your knowledge, skills, language, and years of experience come together into one united culture that sees each feeding experience as part of the foundation for all future feeding experiences. The culture you create from here forward can change everything. The evidence is clear and the resources are available. Your words and actions are powerful, your influence immeasurable. Thank you for your ongoing dedication and advocacy on behalf of the babies you serve.